As the world is swept by unparalleled levels of displacement, festering conflicts, and a convergence of crises, the international community must fully endorse the role of women's empowerment and gender equality in ensuring global peace, security and development, the Security Council and top United Nations officials declared today. In a unanimously adopted Presidential Statement this morning ahead of a day-long debate on “women, peace and security,” the Security Council reaffirmed the need to dismantle the “persistent barriers” facing gender equality, calling on Member States to embrace a “dedicated commitment to women's empowerment, participation, and human rights” and ensure their full and equal participation in peace and security issues. Held annually, the Council's open debate provides an opportunity for the wider UN membership to reflect on the progress made, and accelerate action on implementation of the Security Council resolution 1325, adopted in 2000, which requires parties in a conflict to respect women's rights and support their participation in peace negotiations and in post-conflict reconstruction. However, he expressed concern that “unprecedented levels of displacement” and the “immense human and financial cost of conflict” is testing global commitments to addressing the needs of women and girls around the world while also hindering their participation in conflict prevention, resolution and peacebuilding initiatives. “The confluence of crises we face, rather than distracting from the imperative of gender equality, should drive us to do even more to live up to the principles enshrined in the United Nations Charter and global norms,” said Mr. Ban in his message. “Squandering the potential dividends of gender equality for peace and development has never been more costly,” he added. “Led by UN Women, the United Nations is striving to realize this vision,” his message stated. Following her delivery of the Secretary-General's message, Ms. Mlambo-Ngcuka, who also presented the UN chief's report on women and peace and security, addressed the Council on her own behalf and warned that the shifting trend in conflict – from Iraq, Nigeria and Syria to Somalia and Mali – is seeing a heightening of targeted violence against women, girls and their communities as extremists took control of territory. In highlighting the improvements made in the area of gender empowerment, Ms. Mlambo-Ngcuka cited the Secretary-General's findings, noting that over 80 countries had committed to the women, peace and security agenda; pointing out that the percentage of peace agreements committing to advancing the security and status of women and girls had more than doubled since 2011; and indicating the “unprecedented” six women ambassadors sitting on the Security Council as evidence of “remarkable” gains. “There is now a broad understanding of the importance of women's economic empowerment in post-conflict settings. But peacebuilding and recovery funding still largely ignores women's economic role, and under-invests in their livelihoods,” Ms. Mlambo-Ngcuka continued. On that note, he detailed the efforts made by UN peacekeeping missions in expanding the role of women in peace and security placements, such as the efforts made by the UN Multidimensional Integrated Stabilization Mission in the Central African Republic (MINUSCA) in emphasizing consultation with women on issues related to political participation in the Central African Republic. At the same time, he noted, advocacy by the UN Mission in South Sudan (UNMISS) had resulted in an increase in representation and election of women to leadership and governance roles while the UN Stabilisation Mission In Haiti (MINUSTAH) had increased its strong uniformed presence in internally displaced persons (IDPs) camps and high crime areas where women and girls are most at risk to sexual violence. He warned that internally displaced women often face “double discrimination” based on being both an IDP and a woman, and that most times internally displaced women find themselves caught in situations where institutional capacities have been overwhelmed and extant patterns of discrimination towards women are exacerbated. As a result, he suggested, women and girls must be brought into the fold when it comes to decision-making and development. “Meaningful participation of IDP women and girls in the development, implementation, monitoring and evaluation of laws, policies, programmes and activities that affect their lives at all stages of displacement is key in the response to internal displacement,” he concluded. 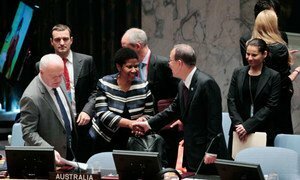 The United Nations Security Council and senior UN officials today issued a strong call on the international community to strengthen its commitment to ensuring that women play a more prominent role in conflict prevention, resolution and peacebuilding.